The wild wild west was a tough place, where men were men and clothing was practical not fashionable. Our view of the time of the cowboy has been influenced by Hollywood and the spaghetti western. A view developed further by the style and fashion of Country and Western music and Line Dancing. The development of western fashion style has left us with two significant neck ties, the String Bow Tie and the Bolo Tie. String Bow Ties are known by a few different names Kentucky ties; String Bean ties, Colonel Bow ties (think Kentucky Fried Chicken) and Gambler ties. 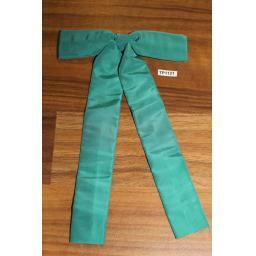 The String Bow Tie is like a cross between a Bow Tie and a Bolo Tie and generally is a clip on tie. Made from a single narrow ribbon it forms a bow at the neck and has two long tails which look like string beans hanging down hence the alternate name. Often seen around the necks of smartly dressed bad guys in old western films these ties portray a cool image of power and unique western style. The String Bow Tie has more recently been picked up by the Country and Western scene and in particular Line Dancing where the brighter designs are growing in popularity. The origin of Bolo Ties remains a mystery. But whether you believe that the Bolo Tie originated in the mid 19th century, worn by early american settlers, or if you believe that it was invented in the mid 20th century by a cowboy jeweler, is to be honest irrelevant. This is an iconic piece of neckwear that is legally the official neckwear of some states in the USA, and has regularly appeared in the UK as an essential style statement. The Bolo Tie is also known as a shoestring tie, a bootlace tie, a western tie or a bola tie. They are constructed from a cord which can be leather or sometimes even metalic, with decorative metal ends known as aglets or aiguillettes and a fibula (an ornamental brooch or clasp). They come in many varied designs and the collector of Vintage Bolo Ties will never tire of finding fascinating new examples of this unique neck wear. The vintage heritage of the Bolo Tie in the UK first comes from being seen around the necks of Teddy Boys in the 1950s as a cool accessory to the drape suits that they wore. The Bolo Tie made a re-appearance in the early 1980s with the rise of rockabilly and again later in the 80s when male hollywood stars took to wearing them. 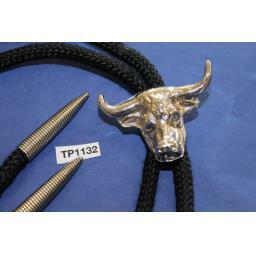 More recently the Bolo Tie has been essential wear for line dancers and western fans alike. Perhaps the most memorable Bolo Tie wearer for me was Vincent Vega when he took Mia Wallace out dancing in Pulp Fiction.